In his 2016 annual letter to CEOs, Larry Fink wrote: “I have written to the CEOs of leading companies urging resistance to the powerful forces of short-termism afflicting corporate behavior. Reducing these pressures and working instead to invest in long-term growth remains an issue of paramount importance for BlackRock’s clients, most of whom are saving for retirement and other long-term goals, as well as for the entire global economy.” He made similar pleas in his 2017 and 2018 letters. A variety of factors has escalated short-termism, including proliferation of technology and Wall Street’s relentless demand (and apparent rewards) for short-term profits. We also see what appears to be a correlation between the rise of short-termism and the rise of activist investors, who often wage expensive proxy fights against middling companies lacking clear long-term strategies. As a result, Boards and management teams are beginning to engage with shareholders more frequently on a host of issues, including strategy and executive compensation. A compensation issue, not just a strategy issue. Declining use of stock options. Options reward for value creation and are long-term focused – senior executives tend to hold options for several years past their 3- or 4-year vesting periods before exercising. Reasons for the decline in prevalence include accounting changes in 2005/2006, shareholder concerns around higher rates of dilution and overhang, and more recently, the adverse views of proxy advisors, who do not consider stock options to be “performance-based.” And then there is the age old adage and long-standing criticism of stock options: Rising tides lift all boats, since even a laggard in a rising market will realize value from stock options. Elimination of DB pensions and SERPs. For many companies, these retirement plans represented a significant proportion of total rewards. The potential values earned were substantial and focused Management teams on building a sustainable organization and sticking with it until retirement. Conformity to 3-year measurement periods. 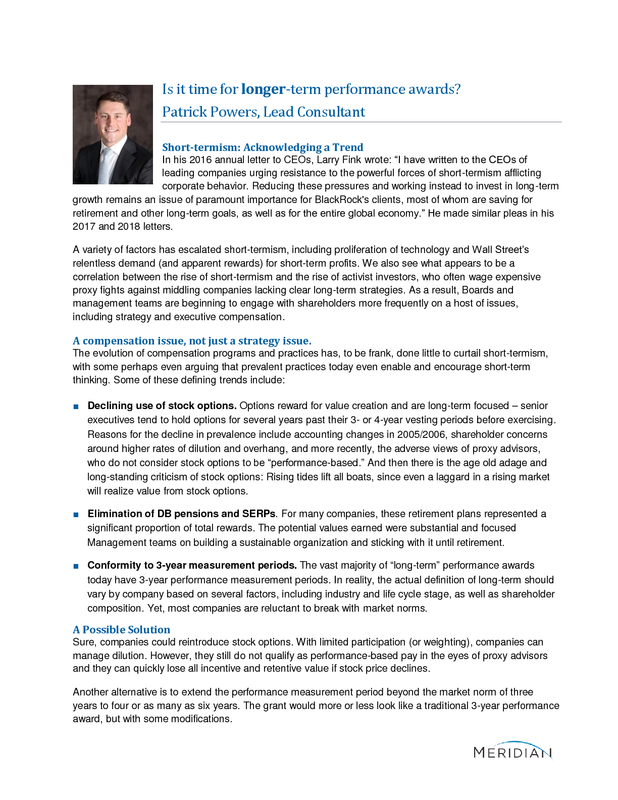 The vast majority of “long-term” performance awards today have 3-year performance measurement periods. In reality, the actual definition of long-term should vary by company based on several factors, including industry and life cycle stage, as well as shareholder composition. Yet, most companies are reluctant to break with market norms. Sure, companies could reintroduce stock options. 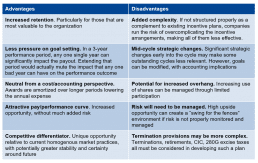 With limited participation (or weighting), companies can manage dilution. However, they still do not qualify as performance-based pay in the eyes of proxy advisors and they can quickly lose all incentive and retentive value if stock price declines. Another alternative is to extend the performance measurement period beyond the market norm of three years to four or as many as six years. The grant would more or less look like a traditional 3-year performance award, but with some modifications. 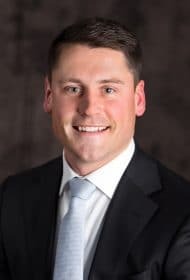 In all likelihood, an overlay-carveout combination may be the most feasible option for compensation committees to implement because it provides Management with a tradeoff (i.e., “new dollars”). Increased Leverage. A payout opportunity that more closely resembles that of an option (maybe 3X-4X on the upside) would offset the discount for added time and risk. 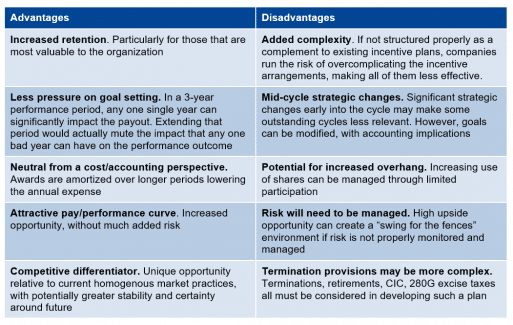 Companies would need to appropriately recalibrate threshold and maximum performance goals, but higher payout opportunities would likely help get buy-in from Management. Targeted Participation. The award should probably be limited to top executives, including those whom are responsible for determining the long-term strategy of the company, and especially those whom are viewed as potential CEO successors (or successors to current leadership at other positions). Performance Metrics. While all traditional metrics remain possible, longer performance periods are probably more apt for market-based metrics (e.g., stock price CAGR, relative TSR, market multiples) and balance sheet metrics (e.g., working towards a target ROIC level of 10% over 5 years). However, revenue or profit CAGRs are fine alternatives if companies have good visibility into future market conditions. Bottom line, the metric should support your long-term strategy and complement the metrics used in other incentive plans. As with all compensation plan designs, there are tradeoffs. We outline some of these in the table below. First, is there a well-developed and articulated long-term strategic framework for creating value? If so, what are the key financial indicators or success? If not or if it is not clearly articulated, then this may not be the right time. What does your investor base look like and what are their expectations and typical investment time horizons? If investors are predominantly institutional, there is likely a strong case for pursing a longer-term performance plan. However, if the investor base is more weighted towards private equity, this type of plan may not resonate. How long do investments take to generate expected returns? — Investments to think about include: capital (e.g., shareholders and debt arrangements), expenditures (e.g., PP&E, R&D, strategic acquisitions, foreign investment), and indirect costs (people development). Summarizing these time horizons will help determine whether a longer-term performance award makes sense for your organization, and how long the measurement period should be (4 years? 6 years? ).